This new jig from David Ellsworth is made of solid aluminum with a bull nose design to prevent nicking the jig on the grinder. 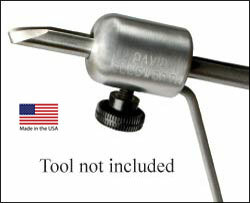 It is used to sharpen the Signature Bowl Gouge (M2 or ProPM above) or any bowl gouge that measures 1/2" or 5/8" diameter. The Ellsworth Jig is used with the Wolverine Sharpening Jig base or a user made base. Instructions for making a support base and for using the jig are included.